My friends and I were in the mood for something middle eastern. Someone suggested Sofra Turkish Cafe and Restaurant and so we went. This wasnt the first time that I came here but the last I came was years back. One thing I like about this place is definitely its ambience. We had hummus for starters. This mildly spiced mixed cream mixture of chickpeas and tahini with lemon juice is definitely a winner. We also ordered turkish bread to go with it. 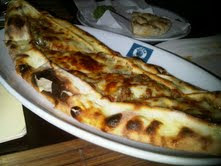 Not only do Italians have pizza, Turkish has their own version of pizza called Pide. We had beef pide for main course. We also tried their Chef Plate. If you're into meat, this is one dish you should try. 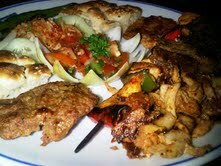 It consists of doner kebab, izgara kofte (flat meatballs) and a skewer of shish kebab. 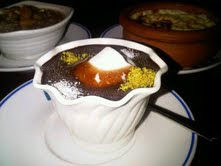 Sofra also serves desserts. There's Baklava which we're all very familiar with. We didnt order that though. 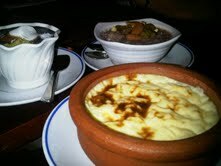 We ordered 3 other desserts - Turkish Chocolate Pudding, Turkish Rice Pudding and Asure. I will definitely come back and try the other turkish dishes that Sofra serves. 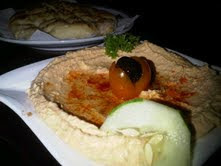 Sofra, I'll be back!